Toyota has announced it would expand its recall of millions of vehicles due to a defect in the accelerator pedal assembly. 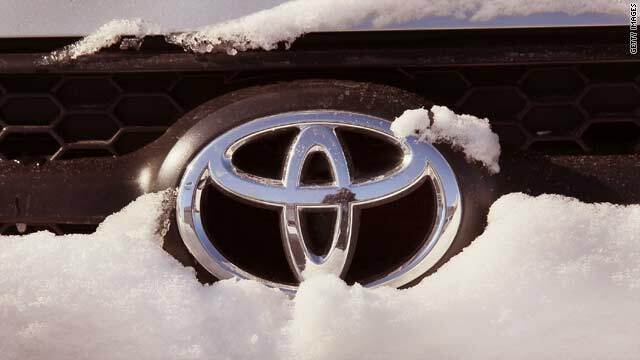 Davos, Switzerland (CNN) -- Toyota's president apologized Friday for the gas pedal problems that have forced the recall of millions of vehicles in the United States and Europe, Japanese media reported. It was Akio Toyoda's first remarks since the latest round of recalls began last week. "We're extremely sorry to have made customers uneasy," he told Japanese news agency NHK. "We plan to establish the facts and give an explanation that will take away the customers' concern as soon as possible." The recall is to correct a problem that, under certain circumstances, could cause the gas pedal, as it becomes worn, to stick partway down. Toyota recalled 2.3 million vehicles in the United States for the problem this week, although no repair procedure has been put in place. A Toyota spokesman said that the carmaker is close to announcing a solution for cars in the United States. The company would still need to get regulatory approval for any proposed repair in the United States and in Europe before a fix could be made. The European recall involves eight models, several of them not sold in the United States. The number of vehicles involved in that recall is under investigation, but could reach 1.8 million, Toyota said in a statement. The recall is separate from one begun in November to fix a problem in which the gas pedal can catch on the edge of the removable floormat. The floormat recall was recently expanded to cover 5.3 million vehicles. In many cases, the same vehicles are involved in both recalls. It was not clear how many different vehicles, in total, are part of both actions. When it came to capturing U.S. market share, Toyota Motor had its pedal to the metal for years. But the gas pedal problems could throw its sales into reverse. The halt of sales and production of the company's most popular U.S. models will cause this month's sales to tumble 12 percent compared to January 2009, according to a forecast from sales tracker Edmunds.com. Michelle Krebbs, senior analyst for Edmunds.com, said that, if not for this week's problems, Toyota's sales would have been up at least slightly for the month. The expected drop could send Toyota's market share below 15 percent, which would be its lowest level in nearly four years. Most of Toyota's rivals are expected to post higher sales compared to a year ago. Ford Motor, which last year reported its first market share gain in the United States since 1995, is expected to pass Toyota in market share in January, according to Edmunds.com. Ford has joined General Motors and other automakers trying to capitalize on Toyota's problems, offering $1,000 to buyers who trade in Toyotas when purchasing a new car. That could be a big problem for Toyota. "People buy Toyotas for their bullet-proof reliability," said Krebbs. "That was their main selling point, and that's taken a huge hit." Even after Toyota fixes the gas pedal problems, it is likely to have trouble regaining share, some say. A loss in market share this year would be Toyota's first since 1994. "This is a game changer for Toyota," said Art Spinella, head of CNW Market Research. "They have some serious, serious work to do to repair the damage done to their image." Spinella said Toyota was already vulnerable. His firm's consumer survey from mid-January showed Toyota had fallen from its long-held position of first or second in quality estimates to seventh among potential buyers. Apparently, recalls that began late last year are having an impact. "This was just the latest recall problem for Toyota," said Spinella. "Word of mouth is the key for all of this, and always has been. And it's much tougher to move back up the list than to fall down." Toyota spokeswoman Sona Iliffe-Moon said the company won't comment about any potential hit to sales or market share before its scheduled release of January sales on February 2. "Clearly there will be a sales impact with the stopped sales," she said. "Really, right now our focus is working on a remedy."